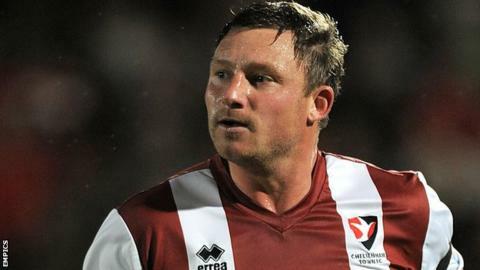 Cheltenham closed the gap on the automatic promotion places with a vital win over rivals Northampton. The game's only goal came when Steve Elliott reacted quickest after Cobblers goalkeeper Lee Nichols did well to keep out the defender's original header. Northampton pressed hard for an equaliser in the second half, with Chris Hackett stinging the hands of Scott Brown from distance. But the Robins held on, despite Kaid Mohamed wasting a good chance late on. The result means Cheltenham move level on points with third-placed Northampton, who hold onto their spot in the automatic promotion places thanks to Accrington's late equaliser against Burton. "We held firm, Scotty (Brown)'s made a couple of saves, but that's what I pay him for, and that's why he's one of the best keepers - if not the best keeper in the division right now. "I thought there were some outstanding performances, but it was a real good team effort from the whole squad today. "Our home record has been right up there with the best of them all season and the lads can be proud of that, we've just got to try and improve our away form between now and the rest of the season! "It was vital that we did win today if we have any aspirations of getting in that top three. We've done it, and we can now build on that and look after ourselves between now and the end of the season." "We did everything bar score and we played really well in the second half, but the game is about margins. "They've scored a goal which is a lapse in concentration by us. We've lost a game we shouldn't have done. "We've earned the right to be the third best team in the league currently and if we want to be automatically promoted, we've got to win games like this. "I don't want to settle for play-offs. I'm not interested in that. I'm a winner and I want the supporters and players to want to win."